17 bidders this week battled it out for a screenshot of a 4chan forum board post. The piece opened with a minimum bid of $500 just four days the screenshot reached an incredible $90,900. Entitled Artwork by Anonymous, the piece is an anonymous post on the board which questions the diminished nature of art. 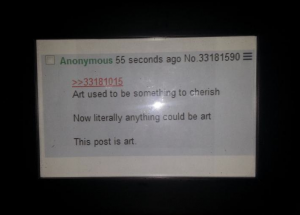 It reads: "Art used to be something to cherish Now literally anything could be art This post is art." The winning bidder will receive a printout of the screenshot on standard A4 paper in a frame. The piece has already been copied by another eBay seller. 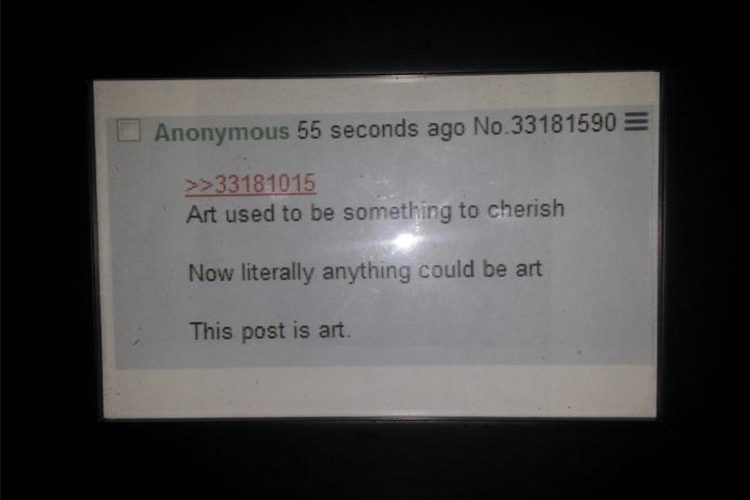 A screenshot of the eBay listing of Artwork by Anonymous has collected over $50,000.